This disc leaves me in something of a quandary. It is in many ways the essence of sophistication; discreetly skilled engineering supporting a generous and wide-ranging programme of Offenbach's most delicious scores played with considerable technical assurance. However, as the disc progressed my sense of cumulative dissatisfaction grew. My listening notes are telling; words such as urbane, smooth, nimble, accurate, neat all feature. However, this is music of the theatre and for the most part I find drama and personality to be nearly wholly missing. That being said, I know this has received warm reviews elsewhere so I would direct listeners to two simple examples; if you respond to the performances of those examples read no further, this review will not chime with your reaction. Example 1; the famous Barcarolle from The Tales of Hoffman - track 7. 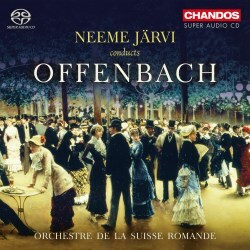 The virtues of the disc are all here; lovely shimmering strings and delicately poised woodwind — the quality of the woodwind principals is a recurring delight — but get to that tune - probably along with that Can-Can Offenbach's best-known popular melody - and isn't it all just a shade faceless? The ensemble and tuning is faultless but I hear no emotion at all in the ebb and flow of this beautiful melody. Example 2; La Grande-Duchesse de Gérolstein Overture (tr. 10). The very opening of this piece - which features a kind of militaristic fanfare and thud on the bass-drum. Where is the belt-tightening, shoulders back, chest-out pomp(osity?) of the music? As with much/most Offenbach there is satire at work so this needs to sounds tin-pot and full of its own importance. Contrast the performance from Neville Marriner with the Philharmonia from 1982 on Phillips. The bass drum thwacks, the brass swagger and the music has character. So, buyer beware. Are you after the sleek well-upholstered luxury of a Bentley or Rolls-Royce or the top-down exhilaration of a two-seater sports car? One other thing to consider, the 'overtures' that Offenbach wrote for use in the theatre tended to be very short - literally enough to raise the curtain and quieten the audience. That to La Belle Hélène was just some sixty bars so nearly all of these works although nominally overtures - and what fantastic tunes they all contain - are really medleys and not all by the composer himself. The Chandos liner usefully indicates their provenance. Comparing various discs of Offenbach collections there seem to be more differences than similarities so in many ways the collector is buying the disc for the tunes themselves rather than any sense of musical authenticity. Returning to Marriner's disc for a moment; the older - much shorter - disc shares, nominally at least, six of the overtures performed here. Throughout, it has to be said the strings of the Suisse Romande are a more refined and unanimous group than the Philharmonia's section from the early 1980s. However, I far prefer the level of engagement and panache that Marriner achieves on the whole. One of the real rarities of this new disc is the charming ballet music from Le Voyage dans la lune. This is ten minutes of pure delightful whimsy. The same music featured on another Philips/Philharmonia disc this time conducted by Antonio de Almeida. In many ways this ballet music suits Järvi's slightly detached approach and the neatness of the Swiss orchestra's playing best. That being said I prefer the extra urgency de Almeida injects into the music at key points; Järvi is more concerned with producing a seamless stream of beauty. The new disc is bookended by two of the best-known and rumbustious overtures. It opens with that Can-Can - well it rounds off the Orpheus in the Underworld Overture and gets what must be one of the fastest performances on disc. All credit to the players for keeping up and maintaining the ensemble but it does feel a bit breathless. The disc concludes with one of the most wholly successful performances on the disc; Antal Dorati's brilliant arrangement of the La Vie Parisienne Overture. Marriner's version is quite different and rather lacklustre. As mentioned earlier, the engineering is sleekly sophisticated. This is one of Chandos' 24-bit SA-CD discs recorded in 5.0 channel surround sound. As with other Chandos discs I find that when listening to it in standard stereo the sound is fractionally distanced and 'soft'. I suspect that with the dedicated equipment the experience is more immersive although I am not sure that it would reveal extra degrees of engagement that I feel too much of the programme lacks. Andrew Lamb contributes a typically informative and concise liner. An attractive well presented disc of delicious music that lacks enough 'roar of the greasepaint' for me.